Many different types of natural opals exist, which exhibit a wide range of rainbow colors and optical densities. These different types of opals can be classified as precious or common opals. Precious opals display a natural phenomenon called play-of-color, which, despite the aforementioned classification as a mineraloid, occurs due to the diffraction of white light through an arrangement of structured silica spheres. The colors that are observed are determined by the alignment and distance between planes of spheres relative to the incident light wave. Due to vivid flashes of color when turned in light, precious opals have been used to make jewelry for centuries. Common opals typically have a milky or pearly luster, known as opalescence. Internal structures of common opals do not display play-of-color like precious opals; however, some varieties of common opals are of gemstone quality. 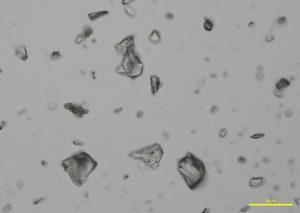 Two types of comminuted grains are observed from an Australian precious opal sample with milky opalescence: Transgranular fragments that are transparent, colorless to pale yellow, have smooth surfaces, and show conchoidal fracture (P-01); and broken grains with rough, porous faces, an opaque body, and rounded edges (P-02 and P-03). Opal grains are isotropic, but low birefringence may be observed along edges due to strain (P-04 and P-05). 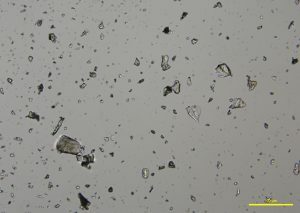 No cleavage is observed in any of the fragments. The refractive index of opal varies from 1.400 to 1.460, depending on the type of opal. The hardness range is from 5-6.5. 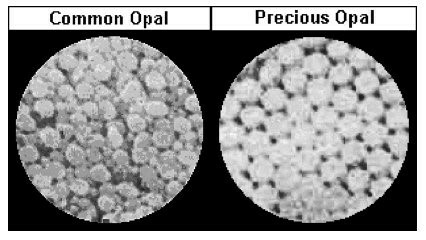 An image (P-06) taken from the International Gem Society (IGS) website compares the arrangement of silica spheres in common and precious opals. Water containing dissolved silicates enters cracks and fissures in rocks, depositing microscopic spheres that eventually form opal. Deposited spheres that form in an arranged pattern and are uniform in size and shape make up precious opals, which diffract light. Formations of spheres that have a random distribution and non-uniform size and shape become common opals. P-01. Plane polarized light, 200X. P-02. Plane polarized light, 200X. P-03. Plane polarized light, 400X. P-04. Fully crossed polarizers, 400X. P-05. Crossed polarizers with red 1 compensator, 400X. P-06. 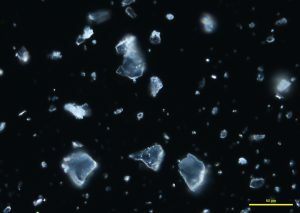 Image of silica spheres in common and precious opals (IGS, 2018). In narrow-band 365 nm ultraviolet light, fragments fluoresce a bright cobalt blue (P-07 and P-08), while broken grains fluoresce a strong sky blue to aqua (P-09). P-07. 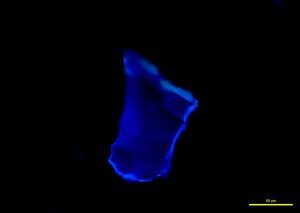 Narrow-band UV fluorescence, 200X. P-08. 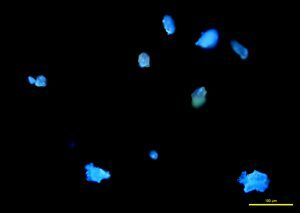 Narrow-band UV fluorescence, 400X. P-09. 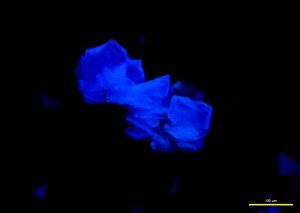 Narrow-band UV fluorescence, 200X. Opal Value, Price, and Jewelry Information. Accessed 18 May 2018. Opal Quality Factors. Accessed 17 May 2018. The Mineral Opal. Accessed 16 May 2018. The Gemstone Opal. Accessed 17 May 2018. Due to the inorganic nature of opal, a carbon coating was applied to mounted fragments to provide conductivity. Without the carbon coating, electrons build up on the sample surface and cause charging effects, even at low voltages. 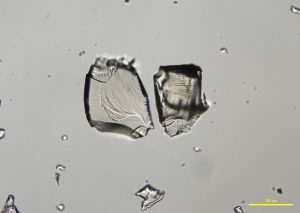 The thin carbon coating, approximately 5 nm thick, allowed for images of opal fragments to be taken in high vacuum using secondary electrons with an accelerating voltage of 10 kV and pressure of 50 Pa. An image of an opal grain showing conchoidal fracture was imaged at low magnification (S-101). 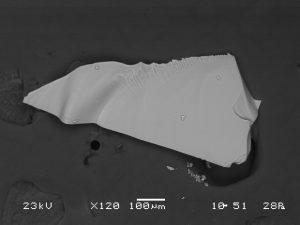 An opal grain was also imaged with backscatter electrons (BEI mode) to examine sample composition (S-102), with an accelerating voltage of 23 kV and pressure of 28 Pa. Opal shards are devoid of crystalline structure and cleavage. S-101. Opal grain, SEI mode. S-102. Opal grain, BEI mode. EDS was performed on mounted opal fragments to provide the elemental composition. 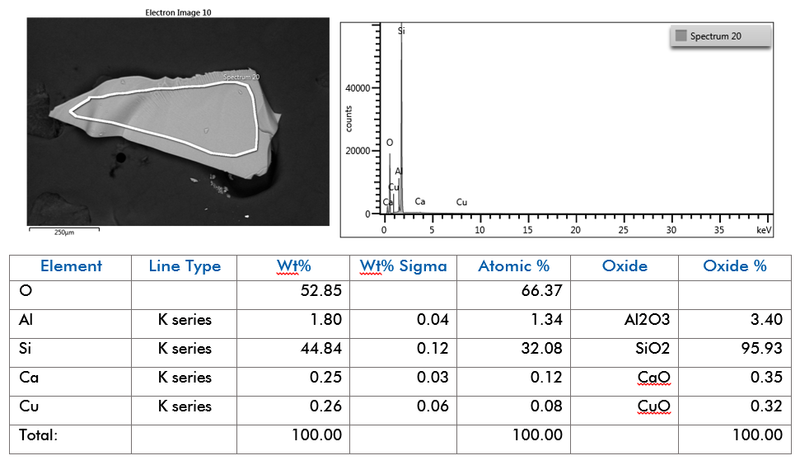 Major, minor, and trace elements detected can be seen in the table, below. Like glass and other minerals in the silicate family, such as garnet (almandine) (AMP:204), and kyanite (AMP:206), the elemental composition of opal is quantitatively measured in oxide percentage. As such, many reference standards are reported in oxide percentages. The electron image, EDS spectrum, and full quant output can be seen in Figure SE-101. SE-101. SEM/EDS data for opal. The spectrum for opal is similar to that of many silicates; one broad, inorganic peak around 1100 cm-1 due to silicon dioxide (Si-O-Si) asymmetric stretching dominates the spectrum. Sharp peaks for non-bonded hydroxyl groups are present in the spectrum at high frequencies from 3600 cm-1-3700 cm-1 (F-101). 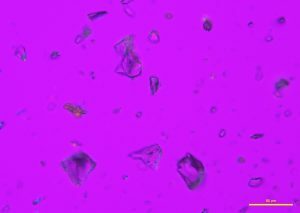 FTIR does not provide a specific identification for silicates. 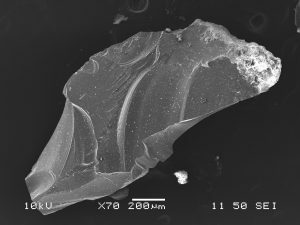 Silicates and minerals are generally best identified by polarized light microscopy and scanning electron microscopy/energy dispersive x-ray spectrometry (elemental analysis). F-101. 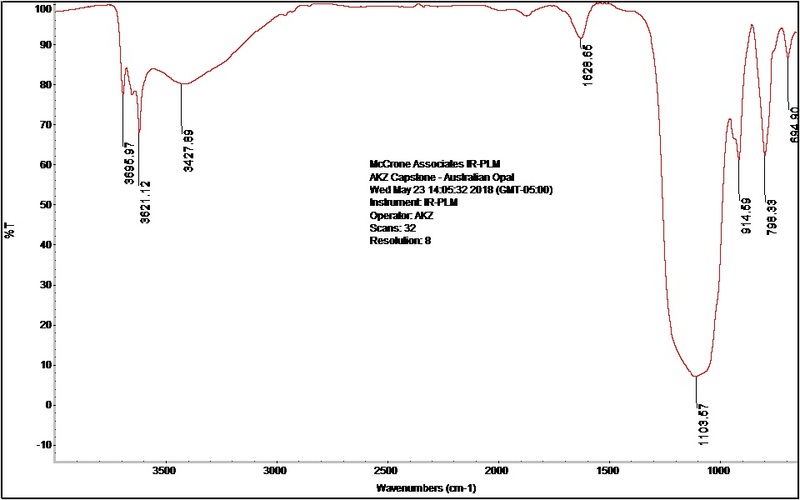 FTIR spectrum for opal.